Selectboard Vice-Chair Kate O’Connor, left, chats with Chair David Gartenstein before the start of a public hearing on the Police-Fire Project on March 2. BRATTLEBORO—Comments from Town Meeting members on March 2 intertwined the potential ramifications of relocating the police department out of the heart of downtown with the ongoing debate over the project’s costs. The conversation around the Police-Fire Facilities Project took this latest turn last week during a two-hour Representative Town Meeting informational meeting, a precursor to a Special Representative Town Meeting on March 12. That day, Town Meeting members vote on the money question, which could result in a culture change for those accustomed to the Police Department being located in downtown. The town is seeking members’ approval to use $4.5 million to relocate the department. “This work” includes extensive life-safety issues like mold, poor air quality, unsafe stairways, and structural issues. For example, a January rain storm perpetrated a partial ceiling collapse — over the shower room and sleeping quarters — at the Central Fire Station. The community has debated funding renovations to the town’s three emergency services buildings in earnest since 2012. The debate itself, however, has lasted decades. Town Meeting members approved the then–$14.1 million project in 2012. 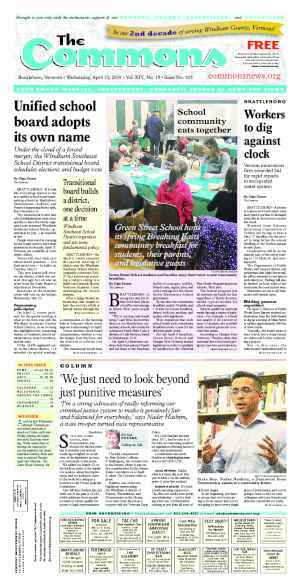 The Selectboard put the project on hold, however, after a citizen-led budget referendum defeated the municipal budget in 2014. Town staff investigated alternative designs with the goal of reducing the project’s price tag. In a 4–1 vote, the board approved — and the police department endorsed — a $12.7 million alternative earlier this year. The alternative included rebuilding the West Brattleboro Fire Station, renovating the Central Fire station — minus a proposed third floor — and relocating the police department to the Brattleboro Reformer building at 62 Black Mountain Rd., on which the town holds an option to purchase. “The idea to move the Police Department up to Putney Road came from the department,” said Gartenstein. Town Manager Peter Elwell assured concerned meeting members that “the Municipal Center option is viable” if they don’t want to move the department. But, cautioned Elwell, the renovations at the Municipal Center would cost approximately $1 million more and not meet all the department’s needs. Police Chief Michael Fitzgerald said that the Black Mountain Road option checks all of the department’s safety and organizational needs, and that the plans to renovate the Municipal Center meets only some needs. The Black Mountain Road location could house all the department’s vehicles and emergency equipment, said Fitzgerald. The $4.5 million to renovate the Reformer building will come from the lump sum that meeting members approved in 2012. The board needs a second vote because the language of the article as approved named the location as the Municipal Center. Members questioned the ramifications of moving the department. “We’re not experts enough to really know if they can provide the same quality of policing from Black Mountain Road or not,” said District 3 Meeting Member Spoon Agave, who has long criticized the project. According to Agave, moving the department to Black Mountain Road includes extra hidden costs due to things like maintaining two buildings and the extra drive time for police officers. “For what?” he asked adding that crime in town is not going up. Town Meeting members’ concerns also included accessibility for people without cars, the loss of a safe place where people could easily go in an emergency, and the divisions between the community and municipality. When questioned about keeping a police outpost somewhere in downtown, staff answered that no, they had no plans at this time. Meeting Member David Manning (District 3), the former owner of a downtown business, said it’s hard to get the police to come downtown already. Moving the department could make the situation worse, he said. “You’re not thinking about the people who are not doing okay,” Manning said, adding that the Selectboard members are pretty privileged. George Carvill (District 1) said that moving the police represents a “slippery slope” of municipal departments vacating downtown. Elwell said the town had no plans at this time to move out of the Municipal Center. “There’s a healthy conversation we would have to have around that,” he said. If the police move to Black Mountain Road, the municipality might become a landlord on two fronts. 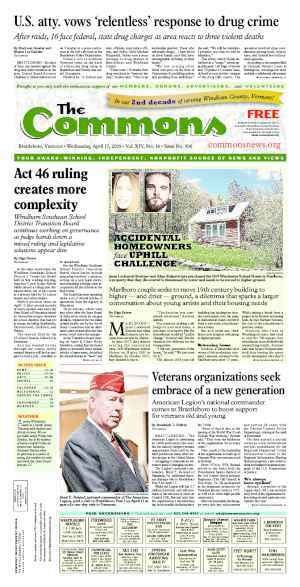 First, the Brattleboro Reformer would lease space at 62 Black Mountain Road once the town owns the newspaper’s headquarters. Second, Town Manager Peter Elwell has stated that the town would rent the newly vacated areas in the Municipal Center to organizations at approximately $7 per square foot. Elwell and Town Meeting Member Bob Stevens (District 2), a local architect, went back and forth on the topic of cost savings and commercial rental competition. In Elwell’s view, moving the police to Black Mountain Road and renting out space in the Municipal Center will save the town money in some areas and be a wash in other areas. For example, the Reformer building would come off the town’s tax rolls. Meanwhile, rents from the newspaper are expected to make up the difference. Stevens, however, disagreed. He listed concerns that the town’s budget would stretch too far trying to maintain an additional building. Stevens who co-owns the Brooks House, along with other audience members, also argued that the town shouldn’t compete with the commercial real estate market. With less overhead — for example, from not having to pay property taxes — the town can keep its rents down, Stevens said. “That’s the slippery slope that I’m concerned about,” he said. Eric Schmitt (District 1) said he didn’t want the town to undercut commercial landlords. He also questioned the hidden-yet-added costs of remediating the life-safety problems at the Municipal Center. “I’m not aware that mold fixes itself,” he said. In an open letter to voters in his district on iBrattleboro.com, Schmitt said that while he supports the Police-Fire Project, he does not support raising taxes. Schmitt wrote that he would vote down any budget that raised taxes. He asked community members what services they’d willingly cut to free funds for the Police-Fire Project. A few meeting members also questioned the viability of renting to the Reformer. The town expects to recoup $20,000 a year for three years in rent from the Reformer’s parent company. 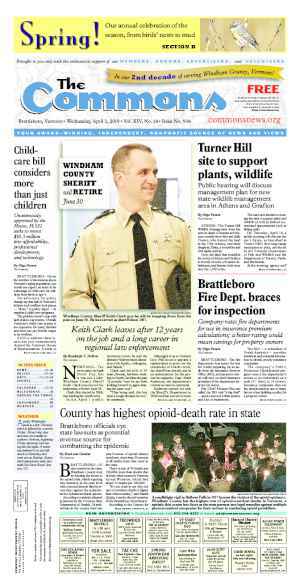 The newspaper is published by New England Newspapers, Inc., a subsidiary of Digital First Media, a national news chain. Deborah Zak (District 3) said she would feel more comfortable with the plan to rent the space if the lease was for five or more years rather than the negotiated three years. 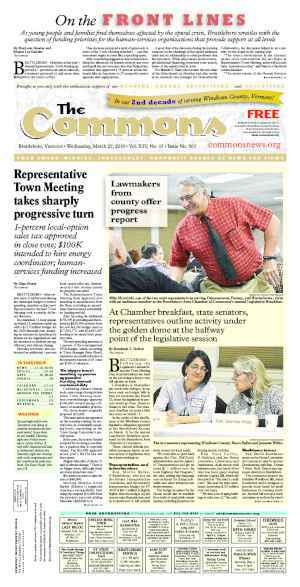 After the meeting and on iBrattleboro, meeting members like Schmitt questioned the ethics of the paper of record for the town should also be the town’s tenant. The Commons contacted Poynter Institute Vice-President of Academic Programs Kelly McBride. McBride specializes in media ethics at Poynter, a leading journalism education organization. “There is a conflict of interest, but it’s manageable,” said McBride. A newspaper becoming a tenant of any powerful organization — municipality, real estate baron, large corporation — can create an environment of competing loyalties, McBride said. As more newspapers sell off their buildings and become renters, such conflicts will become more common, she added. McBride suggested that the Reformer build a firewall into its contract terms to protect against possible retaliation should the paper print something its landlord doesn’t want to read. Police Chief Michael Fitzgerald assured meeting members that the relocation would not hamper officers’ response times. According to data collected by the Police Department, response times from Black Mountain Road to various points around town do increase slightly compared to the Municipal Center as the starting point. Fitzgerald countered this data, however, saying that it’s rare an officer responds from headquarters. Officers spend most of their shifts driving around, the chief explained. When a call comes in, they respond from the field. According to the department’s data, between Nov. 1 and Nov. 15 last year the police received 237 calls that required an officer to respond. Officers responded to the majority of those calls — 65 percent — while on patrol. The remaining 35 percent of the calls officers responded while at the station. “You don’t have to come to the police department to see a police officer — we still make house calls,” Fitzgerald said. He added that most of the community members visiting the police department did so by car. According to data collected by the department in August of last year, of 33 people surveyed, 20 drove to the department, 10 walked there, and three arrived on bicycle. Fitzgerald stressed his department’s commitment to the community and, specifically, community policing. “I absolutely believe that very few people have positive interactions with police, and I am absolutely determined to change that,” he said. Originally published in The Commons issue #347 (Wednesday, March 9, 2016). This story appeared on page A1.